As representatives of 196 world countries conclude their two-week long meeting in Paris, France this week – the 21st annual United Nations Framework Convention on Climate Change Conference of the Parties meeting (COP 21), it is noteworthy that “Human Rights Day” occurs 10 December every year, which is the day on which, in 1948, the United Nations General Assembly adopted the Universal Declaration of Human Rights. In 1950, the Assembly passed resolution 423 (V), inviting all States and interested organizations to observe 10 December of each year as Human Rights Day. This year’s Human Rights Day is devoted to the launch of a year-long campaign for the 50th anniversary of the two International Covenants on Human Rights: the International Covenant on Economic, Social and Cultural Rights and the International Covenant on Civil and Political Rights, which were adopted by the United Nations General Assembly on 16 December 1966. So, too, are the lyrics to The Steve Miller Band’s 1976 song Fly Like An Eagle (Recording)The revolution is the solution, provided too much time is NOT allowed to slip away before Earth’s people take the now critical actions without delay to lesson the human global footprint on Earth’s biosphere, while ensuring that all current and future human populations have clean water to drink, food to eat; shoes on their feet; and do not have to live on the street. It is therefore of the utmost importance that Earth’s land, soil, air, water, plant and animal life are preserved in a life-sustaining state for not just today’s human population but also for all future generations of people. 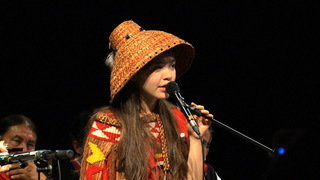 Watch and hear Ta’Kaiya Blaney a 14-year-old activist, singer and actress from the Tla’amin First Nation, north of Vancouver, Canada, perform her song “Turn the World Around” at the International Tribunal on the Rights of Nature in Paris, France. She told Democracy Now! that a Haida elder told her that “to turn the world around, you have to turn it upside down” after singing her song in Paris Saturday, December 5, 2015. Protection of human rights of speech, culture, peace, justice and life is everyone’s choice now. There is hope.